Earlier this week, the news broke that ClickZ Live, formerly Search Engine Strategies, was shutting down. Long-time search pros took to Twitter to share stories of how they got started in the industry speaking at SES. As many of my readers know, I started doing search way back in 2002. It wasn’t long before I realized I had a lot to learn. So in 2003, while working in-house, I convinced the CEO of the company to send me and our IT director to Search Engine Strategies in Boston. I was hooked. I got to hear the movers and shakers, including Andrew Goodman and Brad Geddes, speak at the conference. I met many of the people I’d been chatting with on the Search Engine Watch forums. The content was so valuable that I started attending SES annually. I even blogged about how much I loved it. SES was really the only game in town, and it was a great one. In 2009, I had my first speaking gig at SES. It was the start of a love affair with speaking about search that continues to this day. My last SES was in 2012 (not counting a small local show in Atlanta in 2014). I couldn’t justify attending anymore – I wasn’t learning anything, since the content had been watered down so much; and there were other conferences that were more valuable. 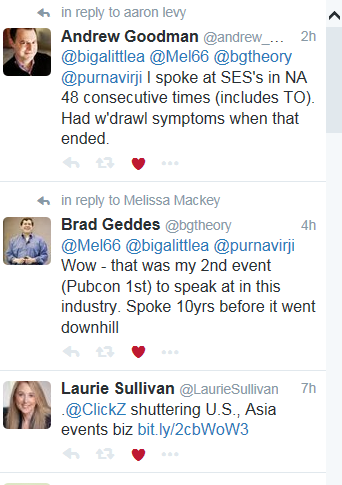 And then, in 2014, SES/ClickZ Live started charging people to speak at the big shows. That was the death knell for the conference for most of us. 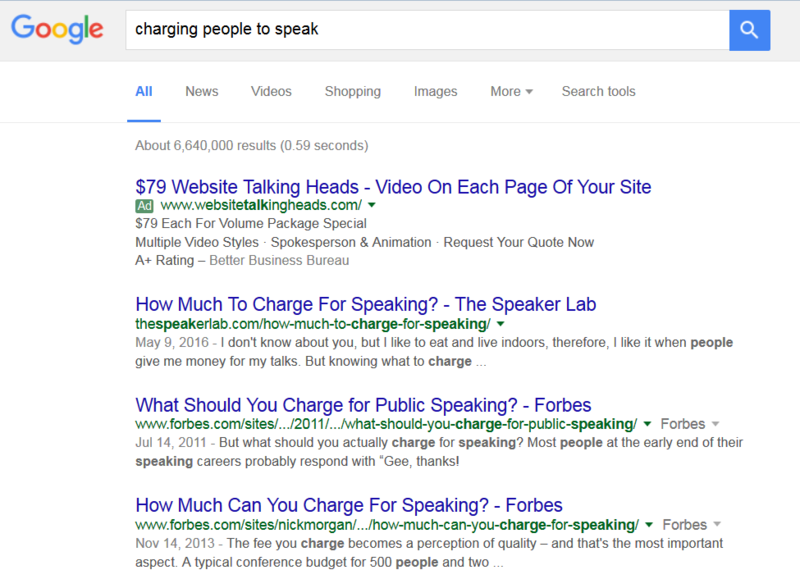 Search pros just can’t afford to pay to speak – and why would we? Many conferences pay their speakers (although, admittedly, it’s not common in the search industry). The whole demise of SES is sad, and yet not surprising. Search Engine Strategies as we know it died two years ago, if not sooner. Not long ago, out of curiosity, I checked the website for a recent ClickZ Live event, and I didn’t recognize a single speaker on the agenda. And the session topics weren’t interesting at all. I couldn’t imagine any search marketer worth their salt paying to attend, much less paying to speak. It truly is the end of an era. Thankfully, there are plenty of other good search conferences out there: SMX, HeroConf, and Pubcon; plus some excellent local conferences such as SEMpdx, SLCSEM, and DFWSEM, to name a few. What are your thoughts on the end of SES/ClickZ Live? Does anyone even care? Share in the comments! I’ve been bookmarking great PPC posts like a madwoman the past few days, and some of the posts are too good not to share. Here are my must-read posts on PPC, and on a couple other topics that PPC managers will find useful. Excellent Bidding in PPC by Lauryan Feijen. This long but worth-the-read post covers how to effectively bid on keywords for best results. If you’re looking to meet your PPC goals, check this one out. Multi-Ad Group Testing by AdAlysis. This video is intended for users of Brad Geddes’s AdAlysis tool, but it’s worth a watch for anyone looking to streamline ad copy testing across large accounts. You could apply the principles outlined in the video to a pivot table and gain similar insights with a few calculations, although it would take significantly more time than it takes in AdAlysis. Incidentally, I’m a huge fan of AdAlysis. If you manage multiple accounts or have a large account with multiple ad tests, this tool is a must for saving time on test analysis. Google AdWords Remarketing Lists For Search Ads (RLSA): The Ultimate Guide by Lisa Raehsler. An oldie but a goodie, this Search Engine Watch post is a must-read primer for anyone looking to take advantage of the power of remarketing lists for search ads. The next 2 posts are on giving great presentations. Even if you don’t speak at search conferences, you probably have to give presentations to clients, or to co-workers if you work in-house. I bookmarked these 2 posts because they’re loaded with tips that I can use right away to make my presentations better. Making Great Presentations by Ian Lurie. A true lesson in the “less is more” philosophy, Ian’s Slideshare deck will have you fine-tuning your PowerPoint decks in no time. Give these great posts a read or view – you won’t be disappointed. Got any great PPC articles to share? Post in the comments! Earlier this week, I had the privilege of speaking at SES Atlanta, a one-day return of the classic SES conference. It had a very different feel from the bigger shows, and it was great to meet a lot of attendees and speakers who aren’t part of the larger-show circuit. The content was very good, with high-quality speakers. Here are a few of the takeaways from the keynotes and paid search track at SES Atlanta. The morning opened with a keynote by Duane Forrester from Bing. Duane has been around since the early days of search, and his keynote was very forward-thinking. I love that about Microsoft & Bing speakers – they really do seem to have their fingers on the pulse of what’s coming. Duane talked about all the ways that mobile is changing the world of search, in a good way. Did you know that the Tesla car has a 20 inch screen powered by search data? And did you know that my home state of Michigan is one of only 4 states that has approved the use of Google’s self-driving cars? I didn’t either. I got one of the best ad copy writing tips I’ve heard in a long time from my friend Lisa Raehsler of Big Click Co. For inspiration, watch QVC or infomercials and take notes! Note the calls to action, benefits, and other language they use. It’s very persuasive and can be tested in PPC. Tracking microconversions was a theme throughout several of the presentations. Kevin Lee talked a lot about tracking microconversions such as newsletter signups or contact form fills, especially in the B2B environment, where actual sales can be few and far between. Omri Levin and Ken Williams of Search Discovery demonstrated how to set up remarketing segments based on microconversions. The last keynote of the day was by none other than Marty Weintraub of aimClear. It was vintage Marty, with 150 slides for a 30-minute presentation. As always, he got through all of them. I presented a B2B paid social case study. I had a ton of fun and met a lot of great people. You can check out my presentation below. Did you attend SES Atlanta? What did you think of the show? Share in the comments!